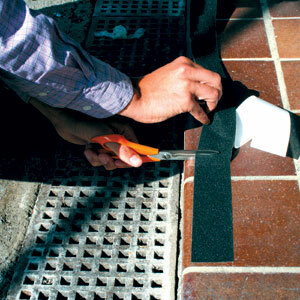 The black Anti-slip tape uses pressure sensitive adhesive to stay down longer than the competition. Different widths allow you to mark out areas or create tracks for wheeled and foot traffic. Highlight hazards, such as areas where machine operate whilst increasing traction, or else to simply give excellent anti-slip protection on steps or slopes.Simply peel off the backing and apply to any clean, dry surface such as concrete, wood or metal. Please note that we would recommend the use of NBB Primer on porous floors to increase adhesion and also the use of NBB Edge Sealer in wet areas to protect edges from heavy scuffing. Ideal Applications: Any walkway, stairway, ramp and entrance or warehouse floor, inside or outside.